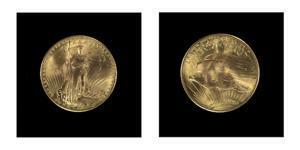 The coins are part of a batch that were struck but then melted down after President Roosevelt took the country off the gold standard in 1933, during the Great Depression. Two were given to the Smithsonian Institution*, but a few more mysteriously escaped. And since we're talking about coins, here's a list of the ten most valuable coins you might find in your pocket change. * This sentence previously referred incorrectly to the "Smithsonian Institute." • Despite violence, fewer Mexicans crossing into U.S.